Thirsty Thursdays: Drinking in the Muslim State of Brunei with my travel buddy Neil! 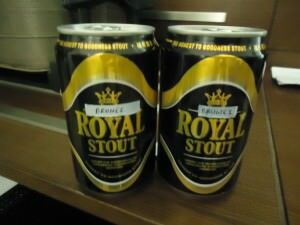 Today’s Thirsty Thursdays sees us crack open the tins of beer that we brought in when visiting the Muslim State of Brunei. 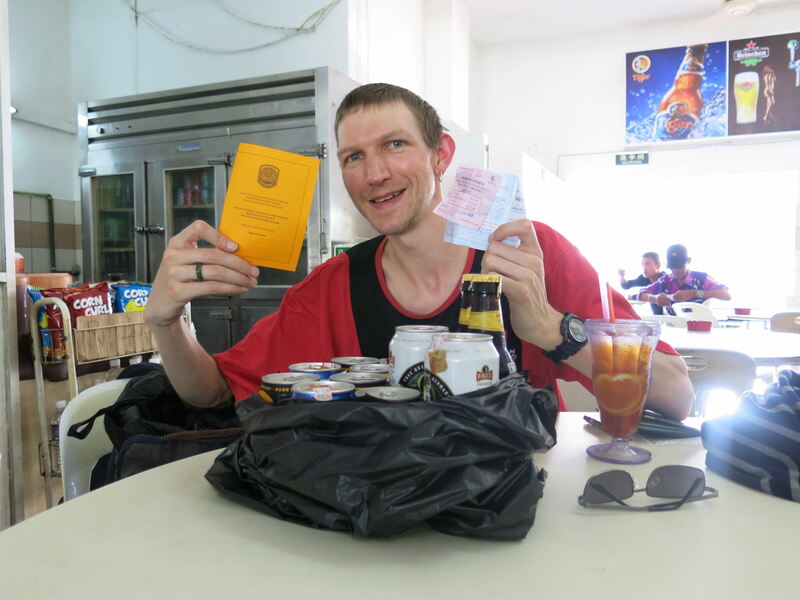 I had drank beer in a Muslim State before – Indonesia of course, but it’s a lot less strict. 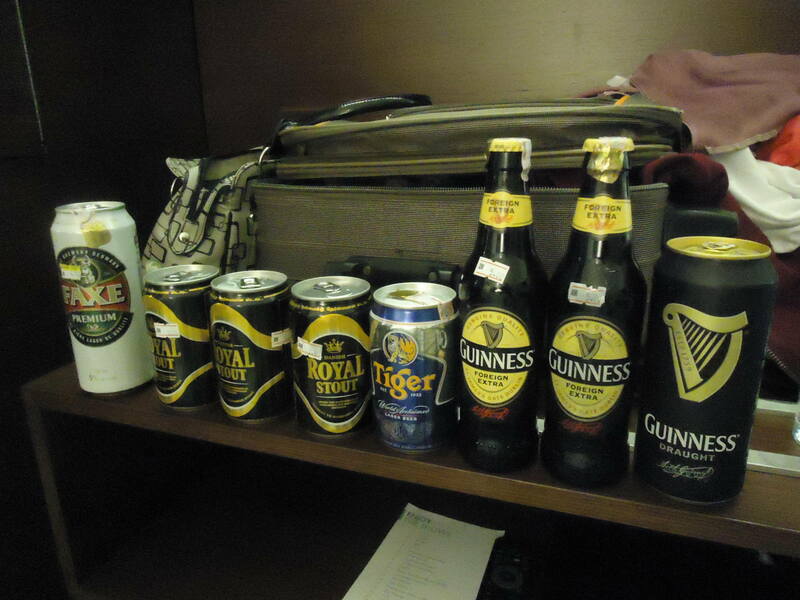 In Brunei, you cannot buy alcohol anywhere, so the only way to be able to drink in Brunei is to bring it in yourself. So obviously that’s exactly what myself and my travel buddy Neil Armstrong (yes, that’s his real name, a namesake of the guy who first stepped on the moon). 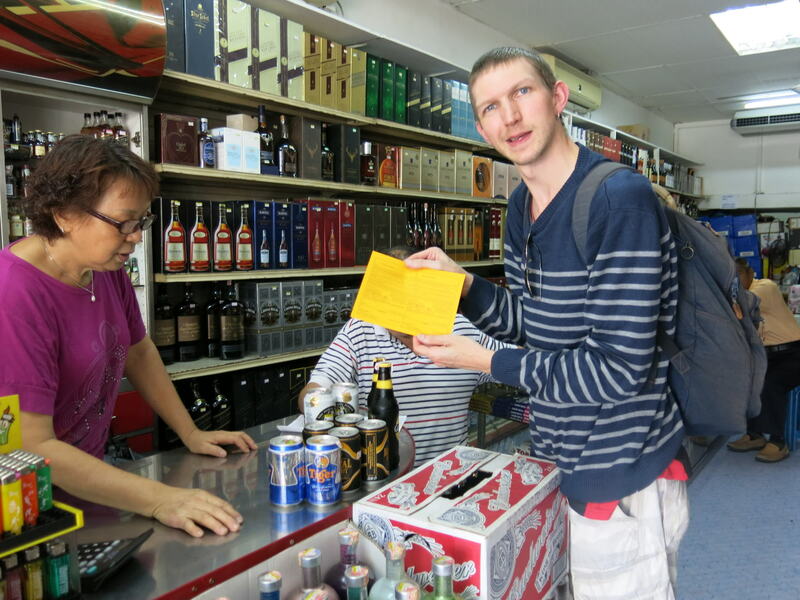 Me buying my alcohol in Labuan to bring into Brunei. First things first you need to get to Brunei (or Brunei Darussalam to quote the country’s full title) and to do that, the best route is a ferry from the duty free island of Labuan in Malaysia, on the island of Borneo: How to get to Brunei from Malaysia. Filling in my Liquor Forms to take alcohol into Brunei – this photo was taken in Labuan, Malaysia. Secondly you need to buy your booze, and you should buy it all in Labuan, which as an added bonus is a duty free haven so it’s really cheap. 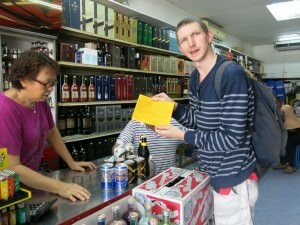 Here’s my full guide to bringing alcohol into Brunei: How to bring alcohol into Brunei. A lot easier than you would think. 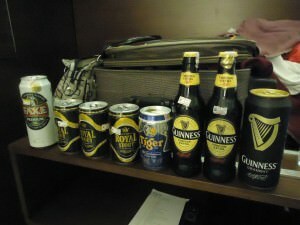 “The Brunei Carryout” for Neil and I in Bandar Seri Begawan. 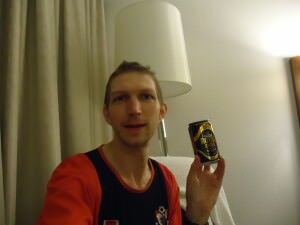 Once you’ve got into Brunei and got your alcohol in, you can drink it! But ONLY in private. You can’t just take your beers down to the seafront, open them and drink them. While nobody really stops you, I just wouldn’t do that, out of respect for the Muslim State of Brunei. Drinking alcohol in public is completely forbidden, so if you want to be a model traveller, don’t even think about it. 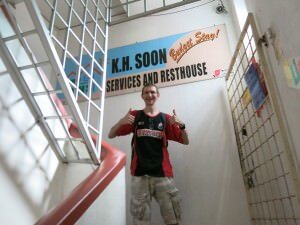 We stayed in the KH Soon Guesthouse – cheap and central. Myself and my girlfriend went cheap and cheerful as usual and booked into the KH Soon Guesthouse in the city centre of Bandar Seri Begawan which was great but even still a bit dearer than the Pusat Belia (the cheapest hostel in Brunei). So we could have drank there (and I did have a beer there while typing up my blog on my second night in Brunei), but Neil was staying in the Radisson with his girlfriend on this trip – a bit more upmarket. A bit too posh for me – the swanky Radisson in Bandar Seri Begawan – but it was our bar in Brunei so I’ve got to leave my prejudices to one side for the night! 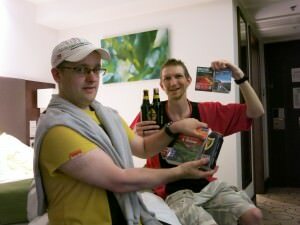 Despite it being a posh hotel (which as you’ll have guessed I don’t really like and normally refuse to stay in them), the only place we could actually drink our legally smuggled booze was in the hotel room. 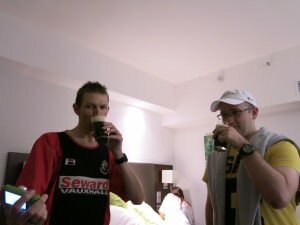 So with Neil’s fridge in the hotel room chilling the Guinness, we burst them open and proceeded to say Cheers – it was a celebratory beer for me having reached my 70th country that day in Brunei Bandar Seri Begawan! And I was celebrating in a muslim state with a Northern Irish travel mate! Thirsty Thursdays and 70 Not Out. Having a beer in Bandar Seri Begawan in Brunei. As we toasted to them and drank them, we planned our sightseeing round the city of Bandar Seri Begawan for the following day – much more to come on that, so far I have only written about the Jame Asr Hassanil Mosque . Then talk turned to a quiz on how many Muslim countries we could name. Neil and I did alright. 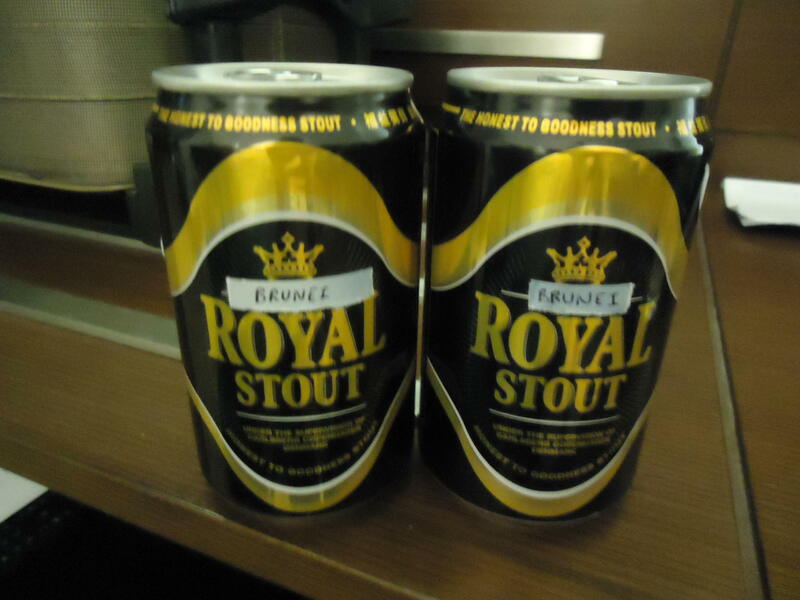 Some fake Brunei Beer – the stuff doesn’t exist. You’d have to doctor a tin. I had shockingly only been to 4 of them (though have 2 more planned) but Neil and I got into the 30s with naming Muslim States – there really are a lot! 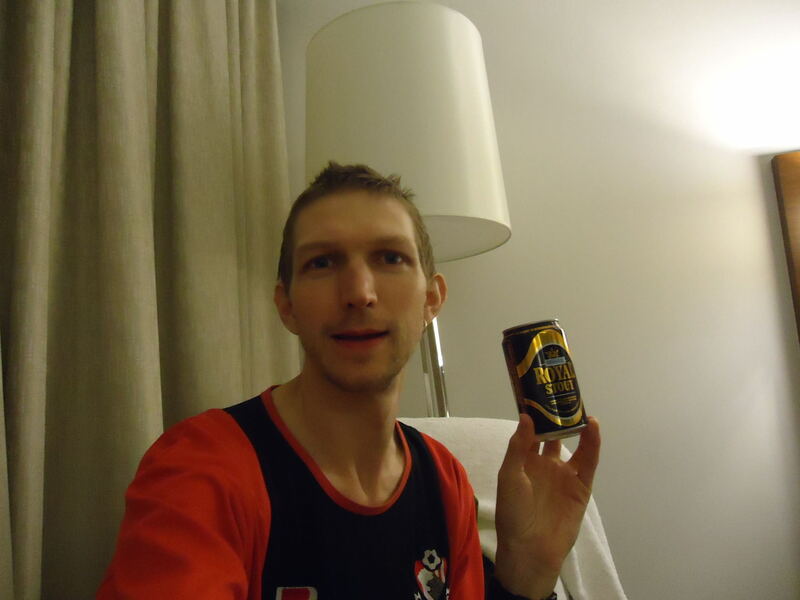 So I’ve now had a beer in Brunei and loved it. Rumour has it that there is a hotel way outside the city (The Empire – a bit posh) that allows consumption of alcohol in its lobby, so in essence away from your hotel room, this is the only “bar” in the country. Myself and my travel buddy Neil drinking a Guinness in Brunei. Travel bliss as I like to call it! You could of course pour it into a bottle or drink it from a cup. But why bother? Respect their culture, enjoy your hotel room ice cold beer and safe travels. 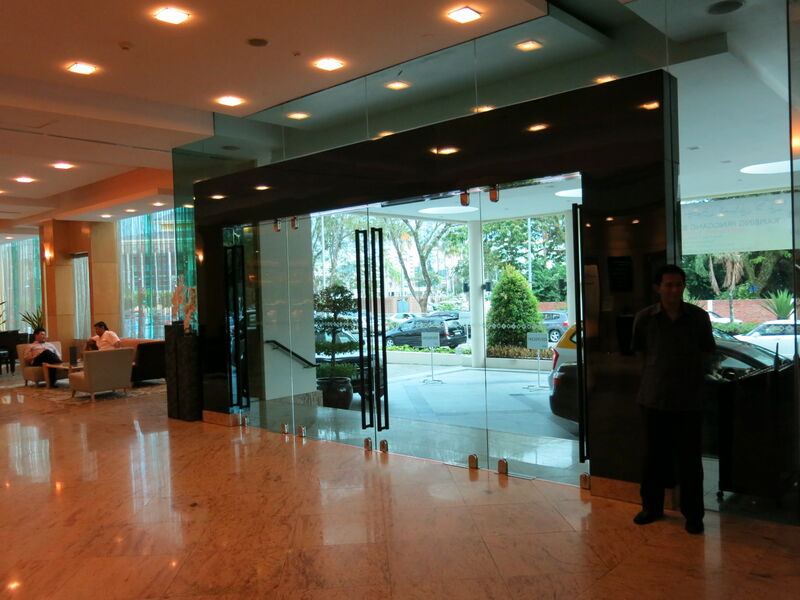 This entry was posted in Asia, Bandar Seri Begawan, Borneo, Brunei Darussalam, Daily Features, Destinations, Thirsty Thursdays. Bookmark the permalink.